Confirm the referencing requirements of your school with your lecturer, and use the MLA Handbook. 8th ed. to clarify referencing rules or if you need more examples. This guide is based on this publication. MLA is an in text citation style. This means you insert a brief reference (‘citation’) into your writing whenever you use a source. The in text citation is made up of the author of the source and any page reference enclosed in round brackets. 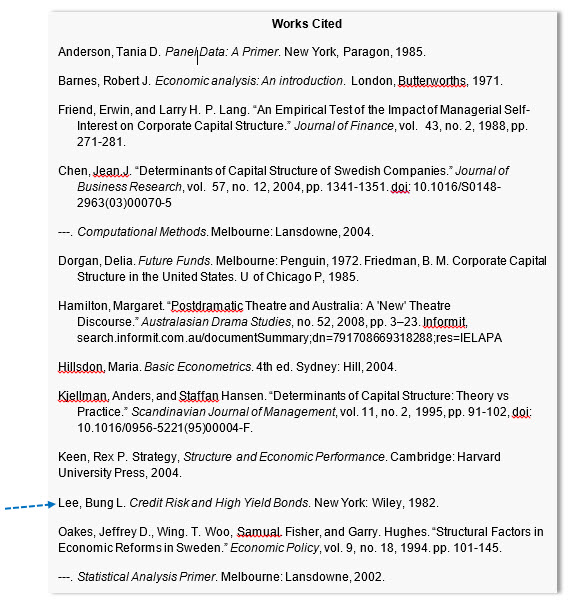 For each source identified in the text, you also need to create a corresponding entry in the Works Cited list. The Works Cited list is an alphabetical presentation of all the sources used in a piece of writing. Each entry in the Works Cited list should contain enough identifying detail to allow your reader to locate the source if they wished.